The fire ravages Notre Dame. Photo: Wikimedia Commons. Air France is to offer free flights to people involved in the reconstruction of the Notre Dame Cathedral in Paris. The 850-year-old cathedral was extensively damaged in a fire Monday night that ripped through its spire and roof for several hours, shocking people around the world. More than 600m euros have already been pledged to restore the cathedral, one of the world’s iconic cultural attractions. READ: Air France innovations help take the stress out of travel. 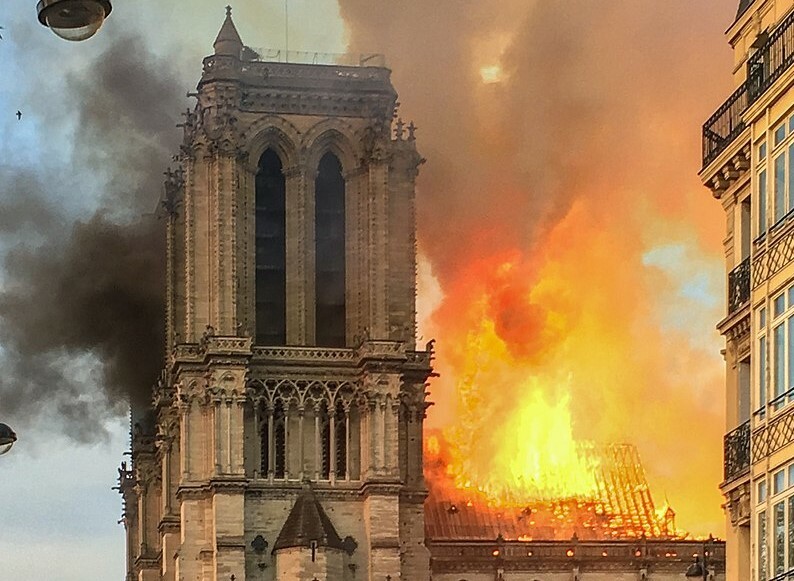 Although the famous bell towers and rose windows remain intact, there is damage to the building’s medieval wooden structures as well as worries about the effect of the fire on its stonework and even its much-photographed gargoyles. Some experts are asking whether the work of the original artisans can be recreated but the feeling is strong that it should be rebuilt. French President Emmanuel Macron this week pledged to rebuild the cathedral within five years, saying France will mobilize for the effort. However, experts say the project could take a decade and possibly longer. The French national carrier, part of the wider Air France-KLM Group, said staff had been deeply affected and saddened by the fire. It said Air France-KLM chief executive Benjamin Smith had joined with the aviation group’s president and Air France chief executive Anne Rigail to allow the carrier to “ensure the free transport of all the official actors who will take part in the reconstruction of Notre-Dame Cathedral in Paris”. “In addition, the Air France-KLM Group will set up a voluntary collection system for its customers in the coming days to help finance the reconstruction work,” it said. Other companies to pledge support for the reconstruction include tech giant Apple as well as the owners of investment firm Artemis, luxury brand LVMH and L’Oreal. I am prepared to volunteer, I still need some paperwork done, I have studied in the early 1990's with the some of the top autorities in the building construction including Mary Ann Moffitt and Robbie G. Blakemore, I have studied Violet le Duc Dictionnaire Raisonne for over three years, My mailing address is James Leon Mahan; 115 W. 9th St. Apt 314; Newton, KS 67114, I have worked with furniture for over 30 years, I would be a great worker on the restoration in my opinion. Please include me in the restoration effort I would need to be prepared to make the move to Paris, all help is greatly appreciated.